Halloween is a favorite holiday for many fathers. Dads can unleash their inner desires to bring some good-natured scariness to the kids in their lives, and letting go just a little to have some ghoulish fun is something many dads love. So if you are thinking about hosting a Halloween party for your kids and their friends, these tips will help you plan and create a memorable party for them and for you. Involve the kids in the planning process. As you are thinking about the party concept, ask them what kinds of things they would like to do. Check in on treat ideas, game ideas, decorations and more. The more involved they are in scoping out the party ideas, the more engaged they will be in getting ready for and enjoying the event. Decide how many to invite. You will want to figure out how many kids you want to have at the party. Make sure that you don't overwhelm the size of your home or yard, but have enough kids to have fun. If you are planning for smaller kids, try to keep the number around 10 or so. Tweens and teens usually have parties with more kids because they tend to break up into smaller sub-parties, but still try to stay under 20 or so. One birthday party we hosted for a 16 year old son ended up with 38 kids, which very quickly overwhelmed the parents! Figure out who should be invited. Let your kids provide a lot of input into whom you should invite. You want friends who get along well, but don't ignore the opportunity to invite a few kids who may not generally be invited to other events. Using parties as an opportunity to broaden your children's friendship circles can be a good thing. Pick a good date. Some dads do Halloween parties right on Halloween night; others plan something a day or two before. Kids who still trick-or-treat will probably not want a party on Halloween night, so you should plan something just before Halloween or earlier in the day of Halloween. Tweens and teens who don't still go trick-or-treating will usually be looking for a party the night of Halloween. Set costume policies. If you are going to have a costume party, make sure and be clear about expectations. You might want to consider a no-mask night just to make sure you always know who is who and so you can know if you are getting party crashers. Sometimes the costumes can be a bit extreme or risqué so if you want to avoid those problems, make sure you have a few colorful t-shirts available for the less-dressed kids. You may also want to consider a party that makes costumes optional. You will want to create some good, funny invitations that will attract kids who may have other choices on or close to Halloween. Clever invites are usually the ones that get the most takers, and include some of the fun details about the party on the invitation for best results. You should also include on the invitation a note for parents giving them specific times for start and finish and letting them know that they are also welcome. Send the invites out about 2-3 weeks before the party. The best Halloween parties have a general theme. Picking a theme early can help you narrow down the many ideas for decorations, games, treats and more. 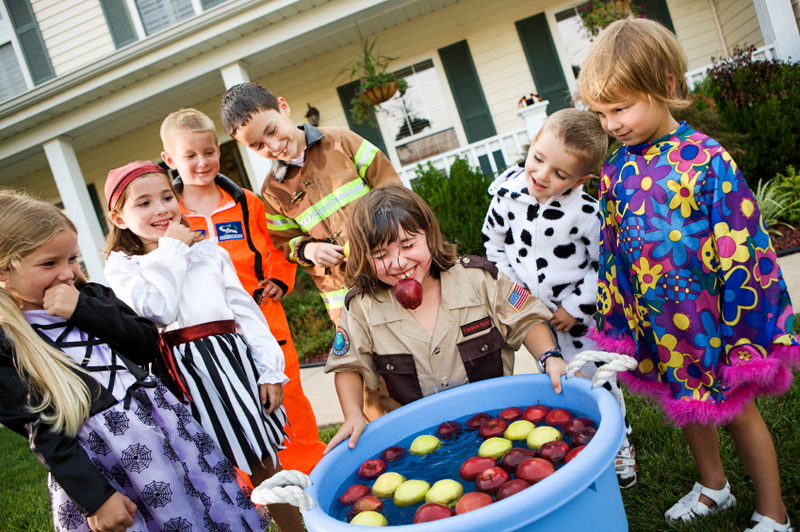 Here are a few Halloween party themes that have worked well for other parents. Every kids' Halloween party needs some rockin' treats. If you plan carefully, you can even have the kids involved in preparing some excellent food for the party. Consider these Halloween-themed treats that will make your Halloween party one they will never forget. Every kid-based Halloween party requires some great party games. The games chosen should be safe, be able to be done in costume, and should be fun and interactive. You should consider some or all of these great ideas. Several dads I know dressed up as a ghost or a scarecrow and sat on the darkened front porch very still and then welcomed guests as they arrived. If you have an older son or daughter, this might be a good role for them. Use scary music. There are some great resources online to download some scary sound effects or music that could be played during the party. It brings a great ambiance to a Halloween party. Have some help. If you are having a lot of kids over, consider asking the dads of a few of the kids to help you with the activities, games, and food. A few extra hands can make all the difference between a good party and a great one. Control access. Halloween parties are notoriously a challenge because of party crashers. Make sure and have an adult or older child at the door to reserve the party for invited guests only. You will also want to control parts of the house for the party goers and keep them out of other areas. Experienced dads suggest getting large spider webs at the local party store and putting them at the entrances to hallways or doorways leading to bedrooms or other areas not on the party access list. Start planning early. Dads and kids love Halloween parties and there will likely be lots of choices. Getting things planned early and building some momentum will let you get ahead of the curve and get kids committed early so yours is the party of choice.